Among the finalists of our Work Design Now series sponsored by Haworth is Rock Companies by ROSSETTI. 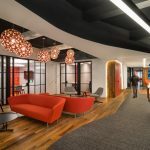 Rock Companies wanted a design for their new executive suite that reinforced the entrepreneurial spirit of the company. Working with ROSSETTI, they produced an eye-popping, yet sophisticated environment with just the right balance of life, work, and play. And they wanted to showcase their own brand values. As the parent to more than 50 companies such as Quicken Loans, the Cleveland Cavaliers, and Fathead, Rock Companies doesn’t necessarily have its own brand. The executive offices are a visual interpretation of the company’s beliefs that extend to its subsidiaries. The suite, located on the 10th floor of the Compuware building with expansive views of downtown Detroit, features an open design to foster a collaborative, fast-paced work environment. Key concepts include creating a high-energy space that is spontaneous, functional, and flexible. Energetic colors against a bright white canvas along with variable levels of light lend character to the space. The few walls in the space are all glass to reiterate transparency as a value. To create spontaneous work opportunities, ROSSETTI placed welcoming meeting spaces and made all walls and surfaces writeable. High-end furnishings and materials impart a certain level of businesslike decorum. Yet there’s also space to decompress by shooting some hoops in the half-sized basketball court. Local art and imagery are both prevalent throughout the atmosphere, meant to be a celebration of the city. 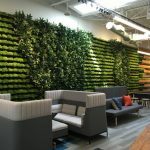 Real estate is an important arm of the Rock Companies business, and executives hope the new offices will help to inspire the revitalization of Detroit through development. While the space is designed as a modern workplace, it is not a trendy showplace. The suite embodies a spirit of adventure and daring in the design collaboration that is unique to Rock Companies’ values.